The superpowers had stationed warships in foreign ports. Their tasks included the defense of the traders and citizens serving as diplomats, embassies and consulates and missions in ports all over the globe, the so-called flagging. From the 1870's in East Asia modern cruisers did these tasks. The leaders of the Austrian-Hungarian Navy decided that, the Empire's superpower status and its respect had demanded building similar ships. 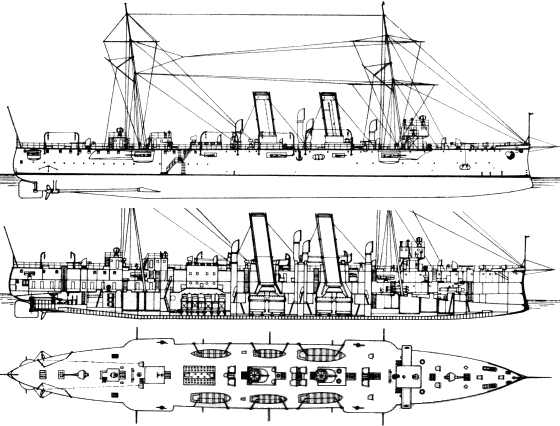 These considerations lead to the making of the plans of a class of cruisers, which are met the expectations of these tasks. The cruisers build had granted in 1895 by Fleet Admiral Maximilian Doublebsky von Sterneck's proposal. So they had built three cruisers named Zenta, Aspern, and Szigetvar. The class had got its name after the first ship Zenta. 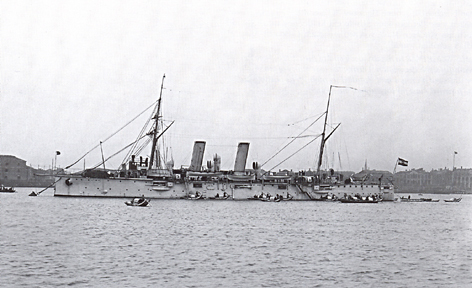 The cruisers were finished in 1899, under the direction of Hermann von Spaun, because Sterneck had died in 1897. Zenta's first trip in 1899 was to the Far East. 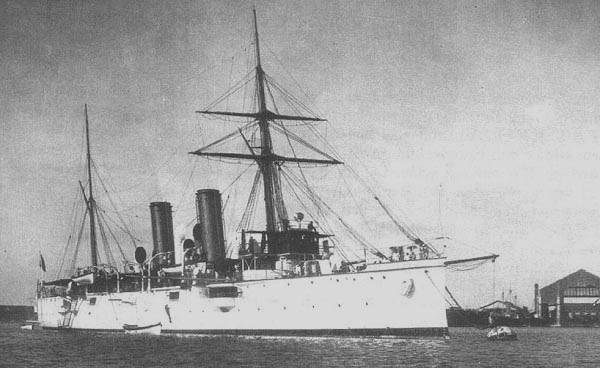 In the spring of 1900, when the Boxer Rebellion was broken out, the cruiser patrolled on Japanese waters. 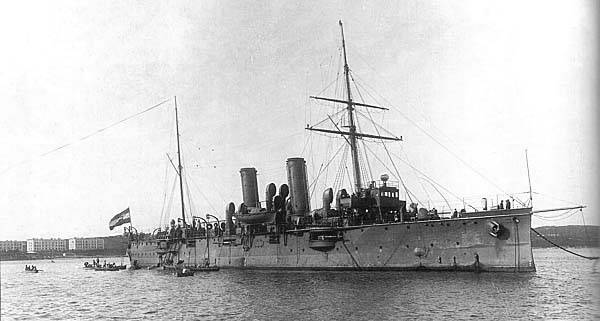 The Austro-Hungarian leadership ordered it to sail to the Chinese port Peiho, where she sat anchor on 7th of September. At the same time SMS Maria Theresia armored cruiser approached and a month later Aspern, same class as Zenta and Kaiserin Elisabeth cruiser followed them. Rear-Admiral baron Rudolf Montecuccoli led the formed fleet. SMS cruiser Zenta anchored in port of Pula. Note the mission cruiser’s painting. Zenta launched her marine corps to protect the citizens and diplomatic services. She had arrived on the 3rd of June along with a German squadron. On 9th of June Vice-Admiral Seymour, who arrived at Takou and became the commander of the international expeditionary forces and dispatched to Beijing to liberate the British Embassy in its severe situation. The captain of Zenta provided 7 field-guns with their crew to aid the international forces. The first clashes with the Boxers were on the 11th of June. From then on they were constantly under attack by the boxers who were aided by the Chinese regulars as well. Seymour had to retreat against the overwhelming superior numbers. They sieged Fort Hsi-Ku where they had built a defensive position. They waited for support here, so their forces could be raised to 16000 men. In the meantime the boxers began to shoot from Fort Takou at the ships anchored in the Pei-Ho bay just in front of them. After the ships' turrets took out the fort's guns, the marines were able to take it with a single charge. The Chinese government openly sided with the boxers now, and requested every foreign citizen to leave Beijing in 24 hours. Before the time limit, however, they killed the German ambassador Kettler on the streets. So Vice-Admiral Seymour led his supported troops to liberate the seized diplomatic service's buildings. On 14th of June they took Tianjin, and on 2nd of August they approached to Beijing with extended force of 40000. Despite the stubborn and stiffened defence, they occupied the city on 24th of August. During the siege the captain of Zenta, Commodore von Thomann, killed in action. Altogether the 4 Austro-Hungarian ships marine corps took part of these fights with 500 men. The fights after the siege of Beijing took months. The cruisers were idle in an enclosed port for the winter. The KuK corps visited Siam, Japan, Shanghai and traveled on the Jangche-kiang River. "As the Zenta and the Kaiserin Elisabeth arrived at home waters and the officers and all of the crew of my fleet, let me express my well deserved gratitude and thanks for their self-sacrificing and successful struggle in East Asia in harsh and extreme conditions. Welcome all of my best wishes on your lucky return. Regards, Franz Jozef"
In 1902-1903 the Zenta sailed at the coasts of South Africa and South-America. From 1904 to 1914 the ship belonged to the 1st Cruiser class of the Cruisers' fleet. The ultimatum was caught in this rank. In 1914 at the beginning of the Great War, the cruiser was ordered to sail Cattaro. When, 6th of August Montenegro declared war to the Austro-Hungarian Empire, Lovcen guns opened fire on the port of Cattaro and surrounding buildings. 8th of August the Zenta, the Szigetvar cruisers, Ulan destroyer and the 72F torpedoboat kept the Antivarian radio station and railways under fire. 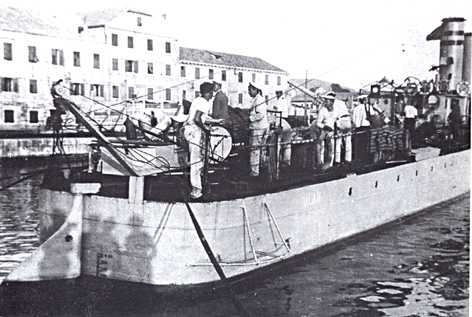 On the 10th of August the Szigetvar cruiser and the Streiter destroyer and the 64F torpedoboat approached Antivari. Then the wardiplomats had declared the blockade of the port. The blockade was ran in turns by the Zenta and Szigetvar cruisers, Ulan, the Streiter and the Uskoke destroyers, the 64F, 68F, 72F torpedoboats. SMS Zenta in port. Notice the boats serviced between the ship and the port. Notice also the bluish-grey colour and the red waterline. On the 16th of August the Zenta and the Ulan destroyer held the blockade. 7:46 am they noticed smoke south-southwest. The commander Commodore Paul Pachner turned the ships and left for homeports. At 8:25 am noticed smoke north as well. It became clear, they met with the French Mediterran Fleet. The French tried to enclose the cruiser with two groups and cut their way back to safe ports. The Streiter destroyer, which sailed to the Cattaro bay to replace the Ulan, noticed the two blockading ships. About half past eight she noticed more ships southwest direction, so she turned back and sailed home. The Ulan was ordered by Commodore Pachner to break out and reach the port of Cattaro, which it done well. Around 10 o'clock she arrived Cattaro under the enemy's heavy fire. The Zenta turned northeast to get close to the coast. It was harder to zero in and her crew had bigger chance to escape from the putatively sinking ship. The enemy fleet was led by the main squadron (battleships Courbet and Jurien de la Graviere) and these were surrounded by 11 units of their support and 4 armoured cruiser followed by three squadrons of destroyers. The British were represented 4 cruiser and 8 destroyer by Admiral Troubridge. The French, after they reached their range, fired at the front of the Zenta requested to stop and surrender. The answer was shown as a small ensign and the silk flag; it wouldn't surrender, but fight against the odds. The fight started at 8:40. The enemy's turrets range were bigger, so they begun fire from 12 km. 8:50 the Zenta got her first hit. When she reached her range she opened fire too. Soon she got hit on a steampipe and the ship stopped. The crossfire of the French devastated the still but heroicly fighting cruiser. Soon she got a hit under waterline and started to sink. 9:20 am the crew got ordered to leave the ship and the sinking ship fought till the last moment with waving flag. Zenta could get hits as well. On Condorcet she hit two 24 cm turret, on Justice a 19 cm gun. The French fleet set sail home after destroying Zenta. It is unclear to date why they hadn't saved the crew, who reached the coast at Castellastuana, after several hour of swimming. They became POWs in Montenegro. 150 people survived of the 324 crew of the Zenta. Altogether 54% of the whole crew died. The surviving sailors were set free in 15th of January 1916, after Montenegro capitulated to he Austro-Hungarian forces. Torpedoboat 81T brought them to Pula. They arrived at 23rd of September. The first naval battle of the Great War showed the Allies, how tough the Austro-Hungarian marines could be. At the start of the war, the Empire's navy was written down. This battle showed there would be a considerable resistance along the Empire's coasts. Nobody expected that, this fleet hadn't withdrawn, but controlled the whole Adriatic Sea. Thanks to those nameless sailors and marines (no nationality mentioned) whose rest in the Adriatic seabed. RIP. In 1923 the ex-crew of the cruiser Zenta returned to the site and one of the cliffs close to the wreck erected a shrine commemorate their escape. Krámli Mihály A Császári és Királyi haditengerészet és Magyarország; Propannonia Kiadó 2004. Nagy Miklós Mihály: Boldog békeidők haditengerészei; Kornétás kiadó 2003. Duna Televízió: A monarchia hajóroncsai; dokumentumfilm 2004. Thank you for this excellent history, Olaf! It is wonderful to see a detailed published account of this battle that I can read online. I did not know that this battle was so significant. I have been doing my family's genealogy for the past year and my brother has been pursuing the military history of our ancestors. My Croatian grandfather, Ivan Zic, born in 1889 on the island of Krk in the town of Punat in the Adriatic served in the Austro-Hungarian Navy during WW1. He was a crew member aboard the S.M.S. Zenta during the battle on Aug 16th 1914. He told us the story of the battle and how he was in the water while the ship was going down. His pants were around his feet and he struggled to get them off while another sailor was trying to cling to him. He had to fight off his fellow crew member so he himself wouldn't drown. He talked about being in the water for hours and about being a prisoner of war with only potato peels for food. Ivan Zic. a tinsmith, emigrated to New York City, USA in Sept. 1923 and became naturalized in 1924. I now wonder if he had a chance to reunite with the surviving crew members for that shrine? Do you have pictures of the Shrine or can you direct me to where I can find more about that? It would be a very nice addition to our family history. My mother, who was born in Yugoslavia in 1918, emigrated in 1931 to America. In 1967 she traveled back to Europe and visited an Austrian Museum (I believe) that had a framed portrait of Commodore Pachner which she took a photograph of. She also got a record from the Austrian Military Archives of her father, Ivan Zic's gold medal of honor for bravery given to him on April 4.1915. I would like to share some photos with this web site. I will check out the members area to do that.